The Association for Medical Education in Europe (AMEE) annual meeting is recognized as the largest annual international event focusing entirely on medical and health care professions education. Do international medical graduates contribute to a culturally and linguistically diverse physician workforce in the United States? John J. Norcini, Ph.D., (seated, 4th from left) pictured with conference attendees. Medical education in Iran is moving towards curricular reform and competency-based postgraduate medical education. As part of this reform, FAIMER President, John J. Norcini, Ph.D., received an invitation from the Council for Graduate Medical Education of Iran to run a series of workshops on assessment. 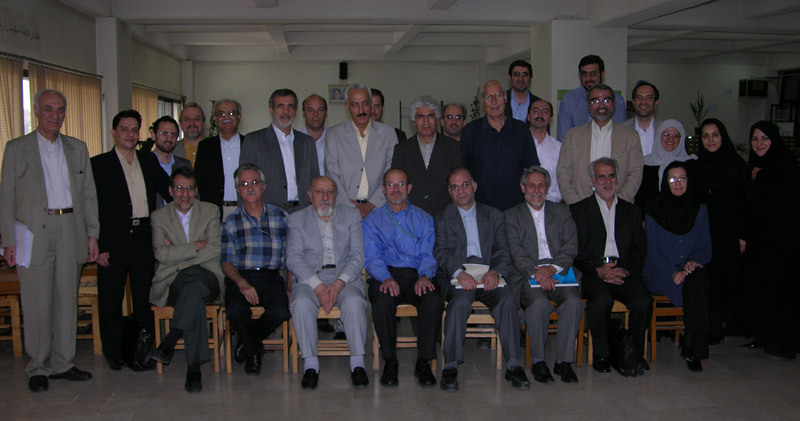 In July 2006, faculty from universities of medical sciences throughout Iran attended a week long conference held in Tehran. Also in attendance were Dr. Mohagheghi, Deputy Minister for Educational and Student Affairs of the Ministry of Health and Medical Education; Dr. Einollahi, Chair of the Council for Graduate Medical Education; and a number of other important educational authorities. Dr. Norcini conducted five workshops on key issues in assessment for participants who were members of Curriculum Development Committees and Chairs of the medical specialties Boards of Examiners. He also conducted three plenary sessions for faculty from Tehran University of the Medical Sciences and Shahid Beheshti University of Medical Sciences. The Ministry of Health and Medical Education also attended the plenary sessions. Meetings to discuss possibilities for collaboration were held with Dr. Larijani, President of Tehran University of the Medical Sciences; Dr. Hosseini, Vice-Chancellor for Educational Affairs, Shahid Beheshti University of Medical Sciences; and other representatives from both universities. Dr. Norcini noted that workshop attendees were knowledgeable, committed to high quality assessment, and enthusiastic (see picture) and that, going forward, there is a good basis for collaboration in a wide range of areas. Travel to the conference was funded by the Joint Program Review Mission of the World Health Organization. Drs. Zali, President of Shahid Beheshti University of Medical Sciences, and Hosseini, Vice-Chancellor for Educational Affairs, provided the facilities for the conference. describe models and systems of education, research, and service delivery that link, and have implications for, both developing and developed countries. The journal specifically encourages papers on community-based health education and research about and from developing countries. In 2004, EfH obtained status as a Medline journal. This has contributed to an increased number of manuscript submissions over the past two years. This growth and the continued attention to serving the international community related to research and educational evaluation studies has resulted in transitioning to an on-line journal. The new publishing format will allow for open access for all readers, on-line submission, much wider and more rapid dissemination of information, and opportunities for news and article alerts to engage and inform readers. The future of EfH is based in collaboration to increase the breadth and quality of the journal and to appeal to a larger audience of health service providers, public health practitioners, policy makers, and researchers. Currently the journal is informed and supported by: Network: TUFH; the Department of Medical Education, Maastricht University, The Netherlands; FAIMER; Global Health through Education, Training and Service (GHETS); Pan American Health Association/WHO; Department of Family Medicine, University of New Mexico; and the University of Illinois College of Medicine at Rockford. Additionally, special theme issues are being developed, such as “Integration of Medicine and Public Health in Practice through a Unity of Purpose and Action” (to be published in 2007). For more information on the journal, its content, and instructions for manuscript submission, please visit “Education for Health” at: www.the-networktufh.org/home/index.asp. Dr. Francisco Campos describes his experience with change management in the Brazilian government’s Pro Saúde project to GSMC-FAIMER Regional Institute Fellows in Mumbai. The Ministry of Health in Brazil has signed an agreement to fund the Brazil-FAIMER Regional Institute. Management of the funding will be provided by the Pan American Health Organization. The agreement was drafted after Francisco Campos, Brazil’s Secretary for Health Manpower, attended the planning meeting of the Brazil-FAIMER Regional Institute in May, 2006, and soon after accompanied Bill Burdick and Page Morahan, Co-Directors of the Philadelphia FAIMER Institute, to the GSMC-FAIMER Regional Institute in Mumbai. 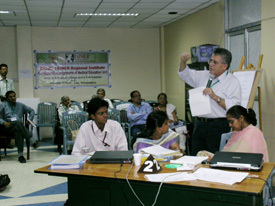 In Mumbai, Dr. Campos observed the Regional Institute in action, and participated in the session on Change Management. Capacity building in health manpower is a priority of the government of Brazil and fits with the recent Pro Saúde Program to increase access to primary health care throughout the country. The experience of Regional Institute development in India will be used to support the development process in Brazil. Further South-South collaboration efforts between South America, Africa, and India are being pursued using the Brazil-Mumbai interaction as a model. The deadline for early registration discounts for the International Association of Medical Regulatory Authorities’ 7th International Conference on Medical Regulation, “Medical Regulation: Global Issues – Shared Solutions,” which will be conducted in New Zealand Nov. 11-14 is Sept. 15. The biennial event draws hundreds of attendees from around the world and features an array of educational events and forums for medical regulators to share information and best practices in international medical regulation. Among the many topics speakers will address during the four-day conference: international trends in medical regulation, the movement of doctors from country to country, global and emerging threats and ensuring cultural differences do not jeopardize effective medical interventions. Social events include tours to various parts of New Zealand, including a trip to the locations where “Lord of the Rings” was filmed. For more information or to register, visit www.iamra2006.co.nz/index.htm. NOTE: James A. Hallock, M.D., Chair of the FAIMER Board of Directors and President and CEO of the Educational Commission for Foreign Medical Graduates (ECFMG) and John J. Norcini, Ph.D., President and CEO of FAIMER are conference speakers. A returning Fellow presents the results of her curriculum innovation project at an interactive poster session to this small group which then discusses the project. Sixteen new Fellows and 24 returning Fellows met at King Edward Memorial Hospital – Seth Gordhandas Sunderdas Medical College (GSMC) in Mumbai, India, from June 13-19, 2006 for the second GSMC-FAIMER Regional Institute. One of the highlights was the poster presentation session, a highly interactive day during which returning Fellows presented and discussed the curriculum innovation projects they have been working on since the first session of the Regional Institute last year. 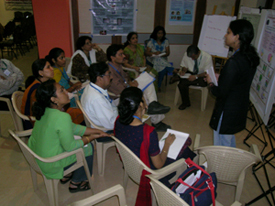 Projects included: a survey of teaching methods for cardiopulmonary resuscitation in Maharastra, which found that only 35% of schools used mannequins; a pilot program in problem-based learning; and use of checklists for formative assessment in performance assessment of occupational therapy students. Another highlight was a discussion of concepts related to scholarship and professional advancement by Nilima Kshirsagar, Dean of KEM-GS Medical Center, and Page Morahan, Co-Director, FAIMER Institute. The GSMC-FAIMER Regional Institute is under the direction of Dr. Avinash Supe, Professor and Head of the Medical Education and Technology Unit and GI Surgical Unit at Seth G.S. Medical College, and a member of the Institute 2002 class. The GSMC-FAIMER meeting gave an opportunity to strengthen our ties, and to look forward. Though I was not directly involved in taking a session, I enjoyed sitting back, observing, facilitating group process and sharing some lighter moments with the group. More than that, I was humbled by the warm hospitality extended by everyone in the GSMC team. I also learned much from Bill Burdick and Page Morahan to restrain faculty intervention so as to encourage and empower the participants for self-directed learning. It was a great break from routine, a stress buster, a rejuvenating experience and great fun, and what else is needed? Thanks for everything. Well done GSMC team!! I underwent metamorphosis as an educator over the past year as I worked on the conception, birth and delivery of the GSMC-FAIMER Regional Institute. The continuous discussions and deliberations between team members of the two institutions (FAIMER and Seth GS Medical College [GSMC] in Mumbai, India) helped me understand the process of evolving a working partnership between two organisations that are culturally different but inspired by common goal. This on-going cross-cultural experience has enriched my vision of the world. I joined the Medical Education Technology (MET) unit of Seth GS Medical College & King Edward Memorial Hospital in 1995. MET had been active since 1993, training over 2000 medical school faculty from Mumbai and across the state of Maharashtra (population 90 million), with workshops on management, research, medical sciences, and other education projects. We have experimented with designs and methods for teaching these workshops and training modules through continuous evaluation of our efforts. The discussions to develop the GSMC-FAIMER Regional Institute were goal-oriented and sharply focused on feasibility. Interactions with Bill Burdick, Avinash Supe and my colleagues in the MET unit during this process enabled me to make contributions that became more purposeful and fruitful. I can better appreciate the difference between the desirable and doable objectives. It has also greatly increased my degree of empathy for those doing this type of development. Use of the GSMC-FAIMER listserv, GSMC Yahoo! discussion group, and WebCT has given me greater expertise in electronic interactions. All these were new to me. As a result of this experience, I have been able to start two additional Yahoo! groups on my own, “medicaleducationunit” for our MET group and “fungushunters” for my colleagues in mycology, both of which are now active electronic discussion groups. The Internet has become a daily part of my professional activities. GSMC-FAIMER Regional Institute brought new people, new ideas, new vision and a new dimension to my life. It helped me explore what was within and trained me to acquire and assimilate what was without! Working with Institute Fellows on their curriculum innovation projects has also been a treasure of learning. Conceptualisation, development and implementation of their education projects through continuous interactions with Institute Fellows and Institute faculty was a new experience. I was introduced to the program evaluation concept of the “Logic Model” for the first time. Discussions with the fellows helped refine my own concepts and thoughts on medical education. I find myself much more confident in dealing with project planning, development, and evaluation. This experience has benefited my work in other areas as well. Networking with like-minded educators across the country was one of the stated goals of the Institute. Through my role on the Institute faculty, I am part of that envisaged network. Free exchange of useful information across India in the field of medical education has been possible through the Institute. Working with our GSMC-FAIMER Institute Fellows has enhanced my skills of communication, teamwork, fellowship and scholarship. I am pleased that I could contribute to the growth of medical educators in India. John J. Norcini, Ph.D., FAIMER President, served as a guest speaker and faculty member at the 3rd Indonesian Medical Education Meeting and Expo that was held on June 5-7, 2006 in Bali, Indonesia. Dr. Norcini taught in one workshop entitled Assessment of Clinical Competencies/Mini-CEX and made presentations at the Clinical Competence Assessment and Clinical Specialist Training symposia. He also participated in a Meet the Expertsession. The meeting and expo is a forum of the Association of the Indonesian Medical Education Institutions and is used to share experience and knowledge among medical schools in Indonesia. Led by the deans of the medical schools, the Association is working to improve the quality of medical education and to stimulate licensure and accreditation in the country. Indonesia ranks fourth in world population, with about 250 million people, and has approximately 52 operating medical schools. John Boulet, Ph.D., FAIMER Director of Research and Data Resources, participated in the World Health Organization (WHO) sponsored meeting on strengthening educational capacity in the prevention and treatment of HIV/AIDS in five African countries (SEDCAP), May 29-31, 2006, in Gaborone, Botswana. In addition to Dr. Boulet, Professor Sam Luboga (WHO Uganda) and Dr. Dan Kayongo (University of Transkei, South Africa), both former FAIMER Institute Fellows, were in attendance. The goal of SEDCAP is to strengthen the human and institutional resources of schools of health professionals in Botswana, Burkina Faso, Malawi, Mozambique, and Uganda. By doing this, their graduates will be better equipped to prevent and treat HIV/AIDS. Hosted by the Department of Nursing Education of the University of Botswana, WHO Collaborating Centre, the event attracted more than 60 attendees, including deans and members of the faculty development committees in the project countries, WHO staff, partners, and donor organizations. Presentations were made to familiarize all participants with the educational capacity and performance needs of the local African institutions, and small group discussions were held aimed at delimiting the relevant local educational challenges and developing specific needs assessment measurement tools. On the final day, country teams were formed and asked to devise country-specific action plans. These detailed plans will be used to initiate the second phase of the SEDCAP project. Danette W. McKinley, Ph.D., Research Scientist, led a roundtable session at the Global Health Council’s 33rd Annual International Conference on Global Health on June 1, 2006 in Washington, D.C. Dr. McKinley’s presentation, Measuring Brain Drain: Combining Data Sources for Effective Analysis, examined the migration of highly skilled health care workers from less developed countries to more developed countries. The session was based on a current investigation describing the characteristics and workforce pathways of physicians educated in sub-Saharan Africa who applied for ECFMG Certification between 1990 and 2004. Several data sources were used to quantify the emigration of physicians educated in Africa to the United States over this 15-year period. The study provides an example of how a combination of data sources can be used to inform “brain drain” discussions. FAIMER staff members presented on various research projects and initiatives at the FAIMER Symposium of International Medical Education Issues at the 12th International Ottawa Conference on Clinical Competence, May 20-24, 2006 in New York City. Topics included: accreditation processes throughout the world, characteristics of the world’s medical schools, migration from Africa to the United States, and immigration from South Asia. Other presentations by FAIMER staff included a workshop on the Mini-CEX conducted by John Norcini, Ph.D., FAIMER President; a workshop on building a state-of-the-art clinical skills simulation center co-presented by John Boulet, Ph.D., FAIMER Director of Research and Data Resources; and presentations at the National Board of Medical Examiners symposium, United States Medical Licensing Examination (USMLE): Performance of International Medical Graduates. The 12th Annual Ottawa Conference was the largest Ottawa Conference to date, with over 1,000 medical school faculty, health educators, policy makers, and researchers from around the world in attendance.